Some women love visiting the hair salon as often as possible, while others only go on special occasions. You might be trying to save money on hair care, so regular visits are out of the budget. Getting your hair relaxed can be cost-prohibitive if you're looking to cut costs -- professional services often start around $75 and go up from there, particularly if your hair is very long and/or you also get a cut or trim at the same time. At-home relaxers can definitely save you money, but don't risk your scalp and hair's health by making mistakes. Above all, make sure you set aside enough time for the relaxing/touchup process. Rushing through a chemical application can lead to disaster. These 10 tips are designed to help you achieve good results if your budget just isn't up to a salon relaxer. Don't decide to relax at the last minute, especially if you just shampooed your hair. If you know you're due for a relaxer, avoid cleansing (this includes co-washing) for about 7-10 days before applying chemicals. You should also avoid scratching your scalp or raking over it with a comb. Any minor irritation can result in the dreaded burning once the relaxer is applied. Most relaxer home kits tell you which supplies you'll need, and much of what's required comes right in the box. Take a good look at your supply list and have everything within reach. The time to have an old towel on hand to wipe up any spills is not after the spill happens. You'll save precious time by having all the necessities nearby before you begin the process. For the best results, work in small, 1/2-inch to one-inch sections of hair. Big chunks won't relax evenly, leaving you with a less-than-desirable outcome. Using the tail end of a rattail comb to separate small partings (be careful not to scratch your scalp doing this) will net you better results. Just eyeballing the clock and estimating processing time isn't a good idea. Either use a cheap kitchen timer, your watch alarm or the timer on your phone. Leaving a relaxer on too long not only increases the risk of overprocessing, it can be extremely damaging, sometimes permanently. Some women love a "bone straight" look and purposely leave a relaxer on far past the recommended time. This results in overprocessed locks that often lack body, elasticity and tend to fall out of hairstyles. Once your processing time is up, you must rinse as much of the relaxer out before using a neutralizing shampoo. Don't worry about the water bill because you need to rinse as thoroughly as possible. This will take a minimum of several minutes. The more you rinse away before shampooing, the fewer chemicals you have to neutralize. Trying to save time by not following this step completely can lead to overprocessing, damage and possible hair loss, so it's crucial to not rush through your rinse. Maintaining a regular relaxing schedule keeps your hairstyle uniform and doesn't cause undue stress to your line of demarcation. Relax too often, overlapping chemicals onto already relaxed hair, and you'll end up with damage. Go longer than 12 weeks post-touchup and you may experience more shedding and breakage than usual. Around 8-10 weeks after your previous touchup, you'll easily see your new growth, allowing you to only apply the relaxer to this area, and not to tresses that have already been processed. While relaxing on your own is doable, it's always nice to have help. It can be tough to do a good job on the back of your head, even with a couple of mirrors at your disposal. You don't want to risk damage on hard-to-reach areas if you can help it. Use the buddy system, and if your friend or family member is relaxed, you can help her out when she's due for a touchup. Just because relaxer kits are inexpensive and readily available, you should still use caution when using them. Chemical abuse is real and the effects can be permanent. 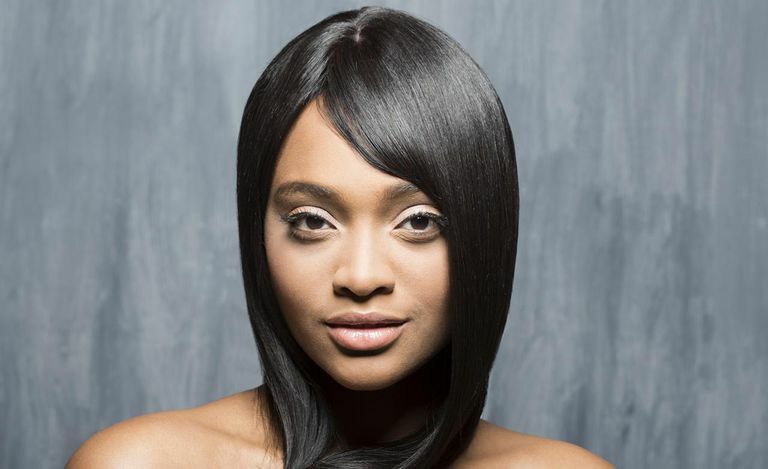 Follow these tips for safe relaxer applications that straighten your hair without damaging it.